Napoleon Jinnies, who recently became one of the first male cheerleaders to perform at the Super Bowl, has spoken about the homophobic bullying he endured for being a gay dancer. 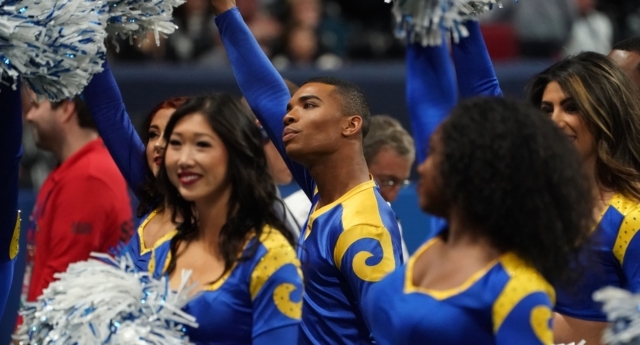 Alongside teammate Quinton Peron, Jinnies became the first man to cheer for a team at the Super Bowl on February 3, having joined the Los Angeles Rams cheerleading squad at the start of the 2018 season. The pair’s history-making inclusion was not referenced at all in the Super Bowl broadcast, but the two dancers received a lot of love from fans. In an interview with Refinery29, Jinnies revealed that as a teen he faced years of anti-gay bullying because of his passion for dance. Jinnies later made the dance team at Orange Coast College, competing at the collegiate level before landing a job dancing in a show at Disneyland. Jinnies auditioned for the Los Angeles Rams cheerleading squad in March 2018, where he met Peron for the first time. The pair each earned a spot on the squad, and have gone on to cheer for the Rams at subsequent NFL games as the team made it all the way to the Super Bowl. Speaking about performing at the event, he said: “The Super Bowl is one the biggest stages in the world — I don’t think it gets bigger than that.